miroque is a solo sound artist from Tokyo. This event was produced with the intention of introducing her music to a Fukuoka audience. 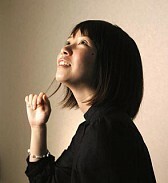 moom-ru is also a solo sound artist and vocalist. moom-ru has been working hard in the Kyushu music scene for some time. She relocated to Tokyo shortly after this concert in order to further her music career.